You might remember that we have sailed with Seabourn before. It has been two years but I still remember rather fondly (to say the least) the free and unlimited supply of bubbly, the free and unlimited supply of all alcohol, the free and unlimited supply of caviar and the incredible service. Add Gordon to the equation and it is the perfect way to travel. Of course the term “free” is relative. The cruise costs a small fortune, but we paid for it months ago and the pain of doing so has subsided. Now we are on board and we don’t have to pay for anything, it all seems such a deal! Gordon leans in conspiratorially , raises a finger to his lips and goes “Sssssssshhhhh”! I can’t believe it. Am I going to have to deal with another round of Gordon adulation. But she doesn’t hear a word I say. She just stares at Gordon with an adoring smile on her face. We have picked this cruise because we will be returning to Borneo and paying our first ever visit to Brunei. But first and more importantly we will be exploring the Philippine Islands, and stopping at four of them as well as at Manila. Sail into Manila and it looks like a huge vibrant city. But scratch beneath the surface and the colour turns to grime, the excitement turns to crime. But we don’t just scratch the surface, we crack it wide open. 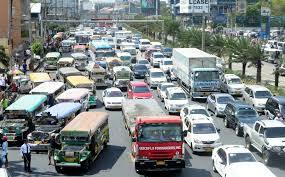 Manila is not easy. It’s incredibly hot with temperatures in the 90’s and the high humidity makes it seem even hotter. It’s over crowded, over heated and sweaty, with unpleasant odors seemingly seeping into every pore. You have to weave your way through a sea of people while watching what you step in. It’s a city where crossing the street requires courage, catching a jitney requires agility and a tolerance of body odors, taking a taxi demands strong bargaining skills and a watchful eye on the driver and just walking the street requires careful surveillance of your surroundings. Sadly the the taxis are the first problem the tourist has to deal with. The drivers are surly and rude, refuse to turn on their meters and demand exorbitant prices. If they do turn on their meters, rumor has it that they can click up the charges with a little switch by their feet. But more than that there are many stories about them not being safe. We hear of the drivers pumping sleeping gas through their air conditioners to knock out the customers so that they can be robbed, or worse. We are advised to watch for the driver switching on the air conditioner but opening his window and sucking in mouthfuls of fresh air. It sounds too far fetched to be true, but every time our driver takes a deep breath we start to worry. 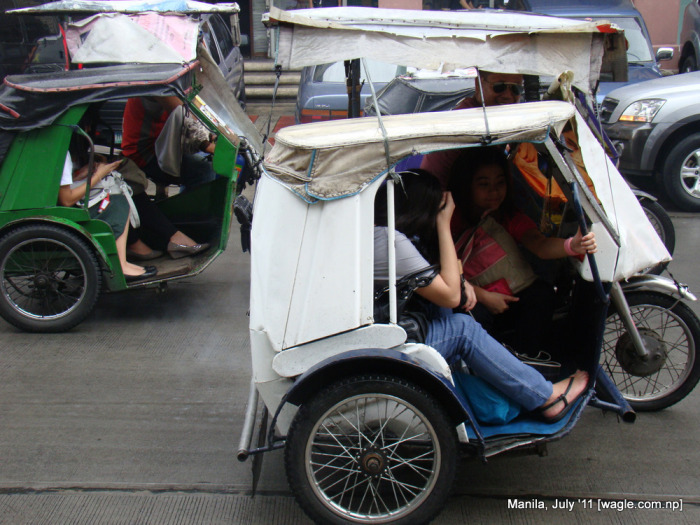 The alternative to the taxi is the tricycle. 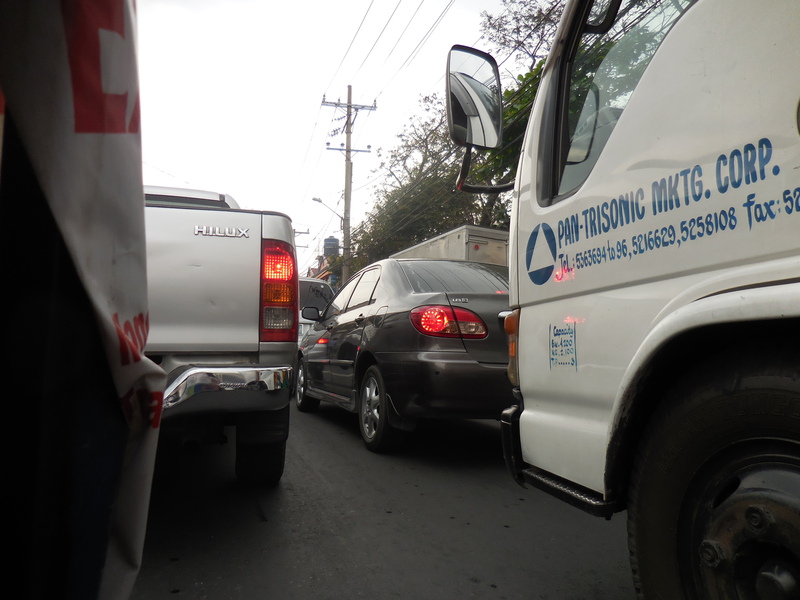 the other way and my face is at the level of the exhaust pipes of the cars around us. As the traffic hardly moves I just sit there sucking in fumes. I feel like a suicide victim after he shuts himself in a car with a hose pipe running from the exhaust. 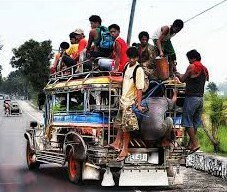 The other alternative is the jeepney, Manila’s famous and fabulous minibuses are based on an extended jeep wheelbase with a personalised and much decorated body. Each one is different and there is no doubt that they add vibrant color to the streets of Manila. Apparently they are designed to hold twenty four people. 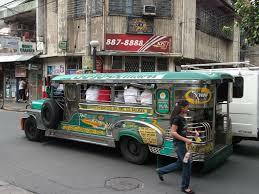 There are two benches facing inwards and running the length of the jeepney. Each bench appears to seat seven, which to me means the jeepney comfortably seats fourteen. But comfort is never an option. If both rows of seats are full, then the next passenger just straddles two laps until space is made for them. There is an open doorway at the back and open windows on the side designed to give airflow. However as you all sit facing inwards it doesn’t work too well. 6. Never look at a policeman signaling you to stop, or pullover. If you don’t see him, you don’t have to do what he wants. 7. If a policeman is standing in the middle of the street directing traffic, it is not necessary to follow his instructions, but you should make an effort not to hit him. Tomorrow we are going to venture beyond the streets, the traffic jams and the crazy drivers. Tomorrow we are going to crack open that surface I was talking about. This entry was posted in Philippines and tagged Manila. Bookmark the permalink. Sojourn? Give our regards to Rossi! Hope Sophie comes back as Cruise Director for you. Hey Rock Stars! Couldn’t believe the traffic. What fun you are having. You forgot to take the bottle of Moët on the ‘transport’! Might have made a journey with a STAR more bearable! 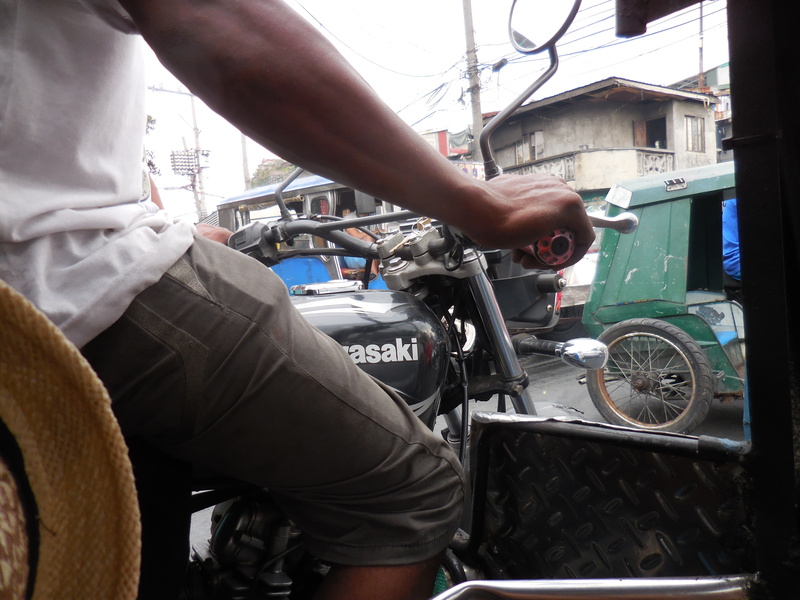 Your head practically in the tricycle driver’s lap. And no extra charge?